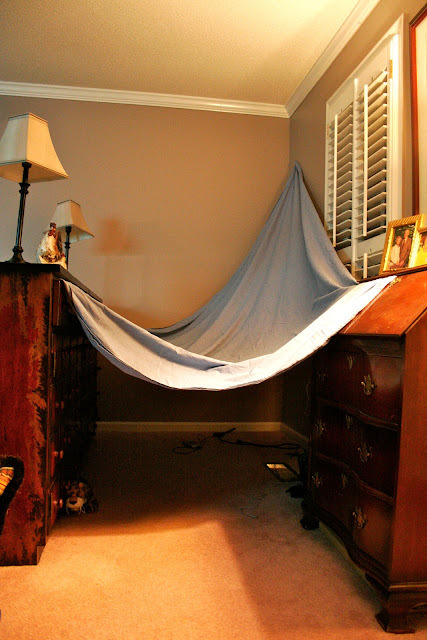 Through the week, it served as a reading fort and -- let's get real -- a DS-charging and -playing fort. But last night, it turned into a Sleeping Fort. Nicholas fell asleep almost immediately, but as usual, Nathaniel read for almost an hour. I typed on my laptop while he read Boxcar Children #4, and he was thrilled when he asked me to go to the Web site listed at the back of the book and we discovered that there are apparently more than 120 books in the series. Good to know. That should carry him through Christmas. That's awesome! I totally remember doing that as a kid. We'll need to make a fort (or, in our case, a Princess Castle) very soon. Loved doing that for my girls. My sister & I loved it when our dad put up a real tent in the back yard for play or sleep overs with cousins. Forts are awesome. But, to be honest, I don't think I was cool enough to have ever slept in a fort with you, but I remember loving them. You were too busy putting on Lee Press-On Nails and spraying fake glitter color into your hair. SET, do not OUT me on my own blog! Lisa, loved meeting you, too. Honored you came by for a visit! How fun. We haven't made a fort in awhile. I loved reading the Boxcar Children series. Mysteries are still my favorite to this day. Nathan is reading the Hardy boys to the kids at bedtime. We just found 7 more at a used book sale on Saturday. Andrew was so excited.